Go outside: Bundle up and stand in your yard, close your eyes, and listen to the quiet sound of falling snow. Inhale slowly to taste the cold and raise your face up to feel the snow gently fall on your face. Build a snow sculpture: Try building something other than a traditional snowman—a dragon, caterpillar, favorite pet, or even a fort! Use bits of nature to embellish animals sculpted from snow. Use sand buckets, loaf pans, and cut-up empty milk cartons to make a cool snow castle. Make frozen bubbles: Grab your bottle of bubble mix (or make your own) and blow bubbles outside to watch them freeze on the wand. Hold it up to the sunlight and see the rainbow of colors! Create snow art: Give kids (and adults) spray bottles full of water tinted with food coloring to decorate the white canvas in your backyard. 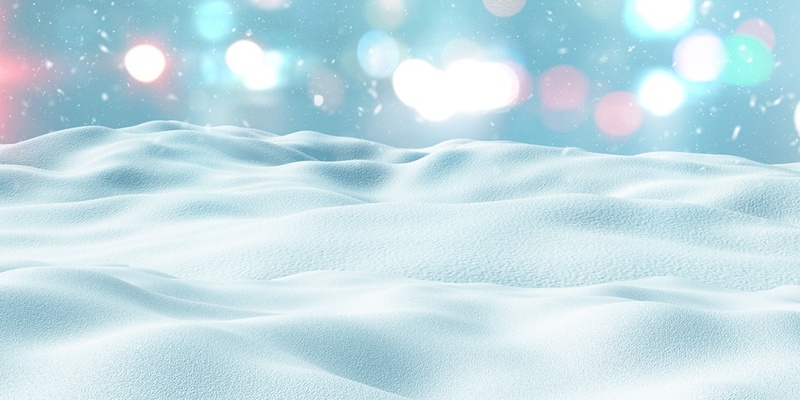 Make snow angels: After a fresh snowfall deep enough that you can’t see the ground, slowly lay down flat on your back and spread your arms straight out. Then keep your arms as straight as you can and swing them almost to the top of your head and then almost straight to your sides. Do this 2 or 3 times, then have someone help you stand up so as not to disturb the snow. For some color, simply fill an empty dish soap bottle with water and food coloring and squirt the colored water onto your snow angel impression, just like using a crayon to color paper. Don’t forget to take a photo and post it on social media! Create a mini snow golf course: Pack down sections of snow to create your “greens” and bury tin cans halfway down in the snow to create holes within the green, making sure to mark them with mini flagsticks. Use a downed tree limb, umbrella (hand grip down for club), or actual golf club to strike your frozen snowball around the course you created. Make snow treats: One tasty option is snow cream, which consists of 1 cup of milk (any kind), 1/3 cup granulated sugar, 1 teaspoon of vanilla extract, 1 pinch of salt, and 8 cups of clean snow or shaved ice (more or less depending on the density of the snow). Sprinkles are an optional (but strongly suggested!) topping. Or, make molasses snow candy—click here to see how to make this Little House on the Prairie treat. Make a catapult: Catapults are a fun way to learn some physics at home. Experiment with them and see how you can make them work better. Try making the arm longer or using different materials. A great site with pictures on how to construct a catapult can be found here. Try using tiny snowballs in your catapult outside or mini-marshmallows when used inside. Try an indoor melting snowman experiment: Grab a bucket full of snow, bring it inside, and create a mini-snowman on a cookie sheet. Next, get a cupcake liner cup and partially fill it with salt or sugar. Place a ruler into the salt/sugar cup to hold it vertically next to your snowman to use as a visual gauge. Using a stopwatch, place it next to your snowman and time how long it takes the snowman to melt. Grade school children can enjoy the visual results, drawing pictures at various intervals on how their snowman looks over time (kind of like a storyboard of the melting process). Middle and high school students can record their data (volume of melt water, dimensions of snowman at various time intervals, etc.) to make a graph and write their observations in a journal. Do comparison projects with a snowman facing a space heater or being blow on by a fan, and engineer designs to help keep the snowman from melting. You could even create a time-lapse video the melting snowman. Need more ideas? Pull out the laptop and visit this site for online snow-related activities that will expand your mind! For more great teaching tips, and to stay up to date on the latest trends in education and education technology, subscribe to the Educator blog today.